The Kona crossover, compact SUV attracted attention from the time it was initially introduced. The vehicle's bold body style is aggressive yet appealing. The Kona is fun to drive and save owners by being fuel-efficient. While visually appealing, Kona was also designed to perform. Potential owners have the option of choosing between two powertrains. The 2.0-liter, four-cylinder engine delivers up to 147 horsepower and comes with a six-speed automatic transmission. The strategic size and positioning of the powertrain components are such that the interior is allowed to have more room for passengers and cargo. The suspension was installed in the rear of the vehicle. But, the system is typically lower, which provides more interior headroom. The vehicle's low profile also provides easy access to the front and rear seats. 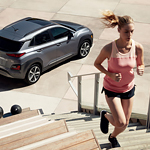 See the new models in our Carter County Hyundai inventory. Embark on a test drive.